​Why did we formulate an MSM gel? Methylsulphonylmethane (MSM) is a naturally occurring substance believed to have anti-inflammatory and cell rejuvenating properties. It is found in many Health Shops in powder form. It can be dissolved in water and juices, and taken daily. As athletes, we take MSM regularly to help reduce inflammation in the muscles and aid with recovery. Dermal application of MSM is up to 40% more effective. We have combined MSM with a plethora of essential oils to increase the potency of the blend, and to provide added anti-inflammatory, analgesic and soothing effects. As a qualified, experienced and insured Clinical Aromatherapist, I know it is important to have high quantities of high quality active ingredients; despite this being expensive. After all, what is the point of having therapeutic claims for a product if the product does not have enough of what it needs to make it effective? We have tried and tested, and continue to use the products we formulate. We also continually strive to make adjustments and improvements to our in-house recipes. MSM is believed to reduce inflammation. Aloe Vera gel is soothing and acts as a good polymer-free carrier for the MSM - we choose high quality Aloe Vera gel. In Aromatherapy, essential oils of Lavender, German Chamomile and Eucalyptus act as great anti-inflammatories, as well as having many other benefits. Ginger is analgesic and help to ease muscular aches and pains. Citrus lifts the mood and helps keep you on an endorphin high long after your exercise ends. The easy to apply non-greasy gel helps ease those hard working muscles and help with recovery. A plethora of natural, pure, high quality, Aromatherapy standard essential oils. High quality food grade MSM powder. High quality Aloe Vera gel. Carefully chosen preservatives of good product suitability; all products need preservatives for safety and protection. Our products are Paraben, colourings and artificial fragrance free. By a trained and qualified Clinical Aromatherapist. I am a full member of the International Federation of Aromatherapists - which regulates our practise. I have completed Aromatherapy Product-Making courses in addition to my Clinical Aromatherapy training. The ingredients in the MSM Gel, and all of my other products, have a therapeutic value. Raw materials are carefully selected and sourced from authentic industry suppliers, with high standards and ethics. Good quality base materials are chosen. Preservatives of the best kind for our skin and of the least toxicity are utilised. Products are hand-made in small batches to ensure freshness and that the active ingredients remain active. Shelf life is limited to ensure that products are used in their prime. How can the MSM Muscle Gel be used? The Gel can be applied to muscular areas of the body as well as to joints such as the knees, wrists and hips. Apply post workout to aid recovery and soothe pain. Use a small amount topically for a couple of weeks as necessary, or use over a longer period of time with less frequency. Our products are extremely high strength. Do not use on the face, in pregnancy, on children or babies, or pets. If you have a medical condition that is being monitored or that you are having treatment for, do get in touch to find out if this Gel is safe for you, or whether an adapted blend may be better for you. Some of our clients have had their blend fine-tuned to allow them to use it alongside Homeopathic remedies. 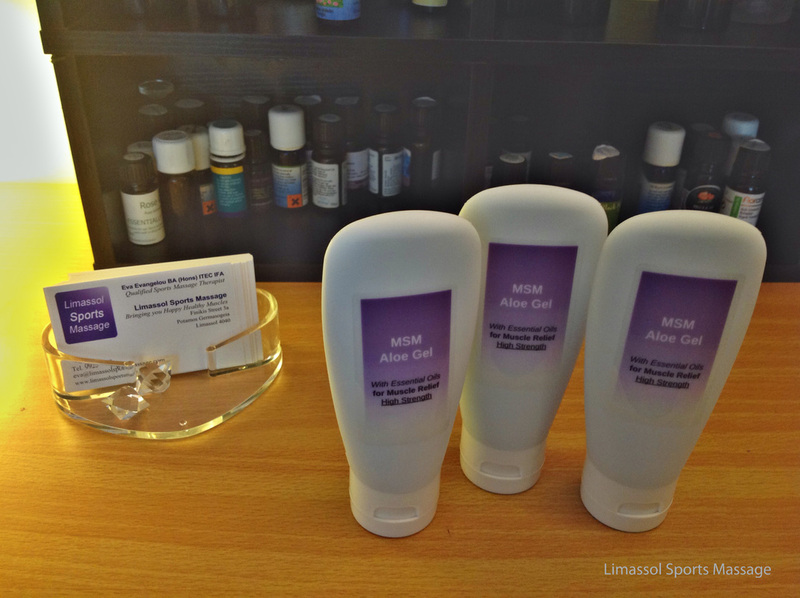 So, if you need some help with recovery from arduous training, to help reduce training related inflammation or to aid injury recovery, do get in touch with us about our MSM Muscle Gel and our other Pure Essential Oil preparations. We are qualified to make custom blends for our clients according to their needs. What is Cramping your style when you run? We have all been there. Mid run, mid swim, when we take our tight fitting boots or socks off, when we have just finished a run. That painful spasm of your digits or calf...incapacitating and painful. It is a strong spasm of the muscle, that pulls against the tendon and renders the unfortunate recipient unable to use that limb or digit. It is most commonly found in the digits of the feet or hands, or the actual feet and the calves themselves. The digits often appear to be in spasm and can look unnaturally and forcibly bent or excessively straight. The giveaway sign of cramp is the sudden onset of pain, stiffness in the muscle and inability to continue with your pace or at all. You may even have a temporarily misshapen muscle as a result of the severity of the contraction. This is not known for sure. It is believed that it can be due to dehydration, an electrolyte imbalance, muscles lacking glycogen, fatigue or a pace that is too fast. How to deal with it if it happens? Stop or slow down if this gives adequate relief. Hydrate, take electrolytes if necessary and stretch the affected area if appropriate and possible. Do not over stretch as this may cause an issue for the affected area - think of the stretch as more of a gentle static lengthening of the muscle and keep it light. You must not force the muscle to stretch as you could injure it. Sometimes, if the cramp is severe it is impossible to stretch; just straightening the muscle may be all you can do. How to stop a cramp from happening? Keep hydrated and bear in mind that running in different climates may result in having different hydration requirements. For instance, if you are running in 14 degrees and wearing a wind proof jacket, you may well perspire a lot and lose extra fluid. If you are running in a humid environment, you may not realise that you are overheating so rapidly. Those running in warmer conditions will have different water and electrolyte requirements. Get to know your body and give it what it needs. If you drink a lot of fluids, perspire a lot or have more wet stools, you may well be in need of electrolytes. A sports electrolyte part way through a long run and at the end of your run can keep your electrolyte levels nicely topped up. Remember to sip to hydrate as a sudden large intake of water messes with your electrolyte balance too. Factor in adequate rest periods in your training regime. Fatigue can lead to tight muscles and tight muscles are more likely to go in to a spasm when challenged mid marathon/long run. Try and keep a more even pace; sudden increases in speed can cause a great challenge to the muscles and create a reflex safety response for protection - i.e. stopping you dead in your tracks! Have enough fuel for your run. If your body needs glycogen (sugar) you are more likely to get a cramp. If you are running for longer than 2 hours, take something to replenish energy during your run. Finally, if your cramps do not respond to the above methods, speak to your Doctor about taking a magnesium supplement. There are magnesium sprays available for dermal application; many of our clients have found these to be helpful. Always speak to a medical professional before supplementation to ensure safety. Make sure that you have conditioned your body well to your training and race demands. We see a number of people who 'pull' races or long runs 'out of the bag'. Strength of mind is great, but your body really does need time to adapt, condition and strengthen. You always pay for a long run or a race; you can pay up front with good training, or later with time out to recover from injury. Eva Evangelou is the Author of 'Say No! To Neck and Shoulder Pain' and the owner of the busy Sports Injury Clinic in Cyprus ~ Limassol Sports Massage. She is a qualified Aromatherapist and Teacher. Articles by the experts in their field. All things running, health, fitness and well-being. Cyprus Ultra is a Michael Rivers production.